I’ve long had issues with the Spotify model for the music industry going forward, and now with Apple Music joining the fold and reportedly paying the same amount, I wanted to sit down and do some vague maths. Is it feasible for a recording musician to earn the minimum wage through Spotify and Apple Music? The maths is based on a rough average that Spotify pays half a cent per listen, and the figures are per year. Cost of an old-school album (that is, sold through iTunes or elsewhere but not streamed) is assumed to be US$10, but that differs around the world too. Old school album sales figures are rounded up to full albums. If you want to keep using Spotify, well… you do you – it is an amazing way to meet new artists. But, knowing that you would have to listen to an album 200 times for the artist to make as much as they would if you bought it outright, if you do really like and support a musician, buy their work directly. (Also, if you listened to the album once a day, it would take you more than 6 months, and maybe musicians deserve $10 for the 6 months of joy they gave you). A musician can live on the minimum wage in Cuba, if they can get 21,600 people to listen to their single, or 2160 people to listen to their 10 track album… OR they can sell 11 albums like pre-Spotify. A musician can live on the minimum wage in India, if they can get 125,600 people to listen to their single, or 12,560 people to listen to their 10 track album… OR they can sell 63 albums like pre-Spotify. A musician can live on the minimum wage in Indonesia, if they can get 208,800 people to listen to their single, or 20,880 people to listen to their 10 track album… OR they can sell 105 albums like pre-Spotify. A musician can live on the minimum wage in Lebanon, if they can get 286,600 people to listen to their single, or 28,660 people to listen to their 10 track album… OR they can sell 144 albums like pre-Spotify. A musician can live on the minimum wage in China, if they can get 503,200 people to listen to their single, or 50,320 people to listen to their 10 track album… OR they can sell 252 albums like pre-Spotify. A musician can live on the minimum wage in Malaysia, if they can get 610,200 people to listen to their single, or 61,020 people to listen to their 10 track album… OR they can sell 306 albums like pre-Spotify. A musician can live on the minimum wage in Russia, if they can get 756,800 people to listen to their single, or 75,680 people to listen to their 10 track album… OR they can sell 379 albums like pre-Spotify. A musician can live on the minimum wage in Brazil, if they can get 950,200 people to listen to their single, or 95,020 people to listen to their 10 track album… OR they can sell 476 albums like pre-Spotify. A musician can live on the minimum wage in Turkey, if they can get 1,517,600 people to listen to their single, or 151,760 people to listen to their 10 track album… OR they can sell 759 albums like pre-Spotify. A musician can live on the minimum wage in Hong Kong, if they can get 1,742,200 people to listen to their single, or 174,220 people to listen to their 10 track album… OR they can sell 872 albums like pre-Spotify. A musician can live on the minimum wage in Spain, if they can get 2,409,400 people to listen to their single, or 240,940 people to listen to their 10 track album… OR they can sell 1205 albums like pre-Spotify. A musician can live on the minimum wage in Japan, if they can get 2,885,600 people to listen to their single, or 288,560 people to listen to their 10 track album… OR they can sell 1443 albums like pre-Spotify. A musician can live on the minimum wage in United States, if they can get 3,016,000 people to listen to their single, or 301,600 people to listen to their 10 track album… OR they can sell 1508 albums like pre-Spotify. A musician can live on the minimum wage in Israel, if they can get 3,097,000 people to listen to their single, or 309,700 people to listen to their 10 track album… OR they can sell 1549 albums like pre-Spotify. A musician can live on the minimum wage in Canada, if they can get 3,836,200 people to listen to their single, or 383,620 people to listen to their 10 track album… OR they can sell 1919 albums like pre-Spotify. A musician can live on the minimum wage in the United Kingdom, if they can get 4,034,800 people to listen to their single, or 403,480 people to listen to their 10 track album… OR they can sell 2018 albums like pre-Spotify. A musician can live on the minimum wage in France, if they can get X people to listen to their single, or X people to listen to their 10 track album… OR they can sell X albums like pre-Spotify. A musician can live on the minimum wage in Ireland, if they can get 4,654,800 people to listen to their single, or 465,480 people to listen to their 10 track album… OR they can sell 2328 albums like pre-Spotify. A musician can live on the minimum wage in Germany, if they can get 4,750,000 people to listen to their single, or 475,000 people to listen to their 10 track album… OR they can sell 2375 albums like pre-Spotify. 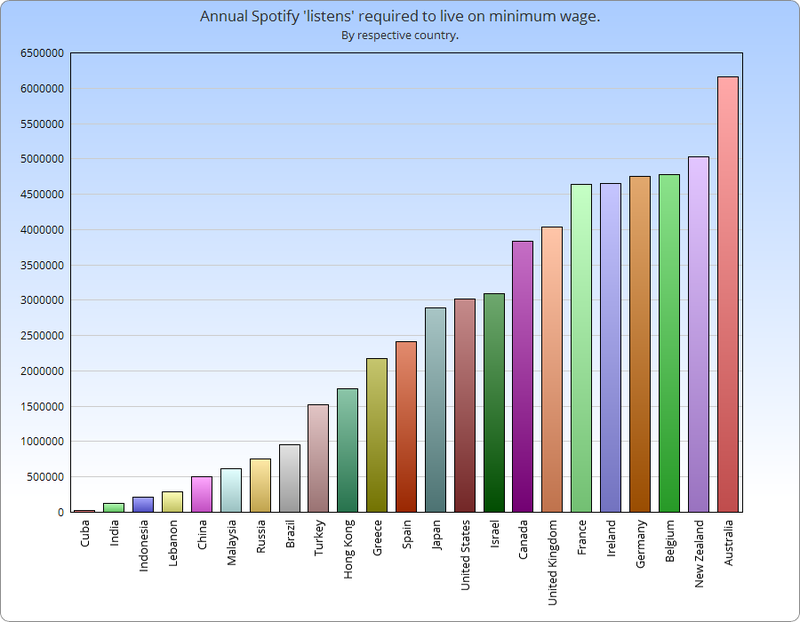 A musician can live on the minimum wage in Belgium, if they can get 4,781,800 people to listen to their single, or 478,180 people to listen to their 10 track album… OR they can sell 2391 albums like pre-Spotify. A musician can live on the minimum wage in New Zealand, if they can get 5,029,600 people to listen to their single, or 502,960 people to listen to their 10 track album… OR they can sell 50,296 albums like pre-Spotify. A musician can live on the minimum wage in Australia, if they can get 6,158,200 people to listen to their single, or 615,820 people to listen to their 10 track album… OR they can sell 3080 albums like pre-Spotify.